Tow by tractor or use by hand. 350lbs Cap. The high sides on the Agri-Fab 45-0345 Tow/Push Poly Tipping Cart ensure you’ll have no problems transporting bulky items. Wide, large diameter pneumatic tyres allow smooth movement over rough ground; and a heavy-duty 5/8” axle provides robust support. Other key features include yellow di-chromate hardware for corrosion-resistance; and a universal hitch-pin that facilitates use with any make of ride-on lawn mower. Our Poly carts make a great lightweight choice. Our convertible cart can be towed by a tractor or used by hand as large capacity two-wheel dump cart. Our carts are vacuumed formed using only quality poly, thus causing them to be unmatched by other brands. They resist scratches and rust, and easy to dump and make less noise over rough terrain. 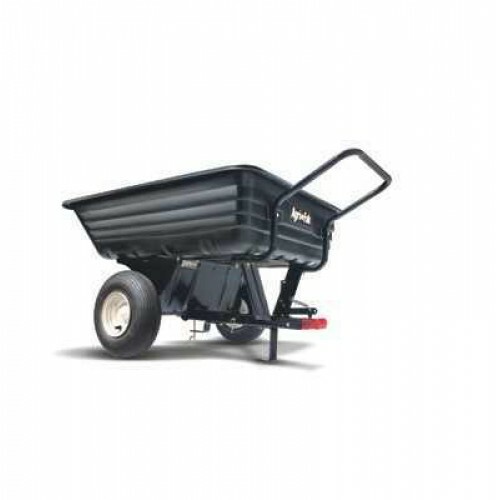 Whether the job is getting rid of yard refuse, hauling firewood, moving sand or dumping gravel Agri-Fab carts will provide tasks safely, reliably and efficiently for years to come. * Capacity: up to 350 lbs.